Primary Arms is well known for quality optics at reasonable prices. Their new 4X Compact Prism Scope with their Patented ACSS Reticle “Advanced Combined-Sighting System” continues that tradition. It has everything you could want in an affordable and easy-to-use package. 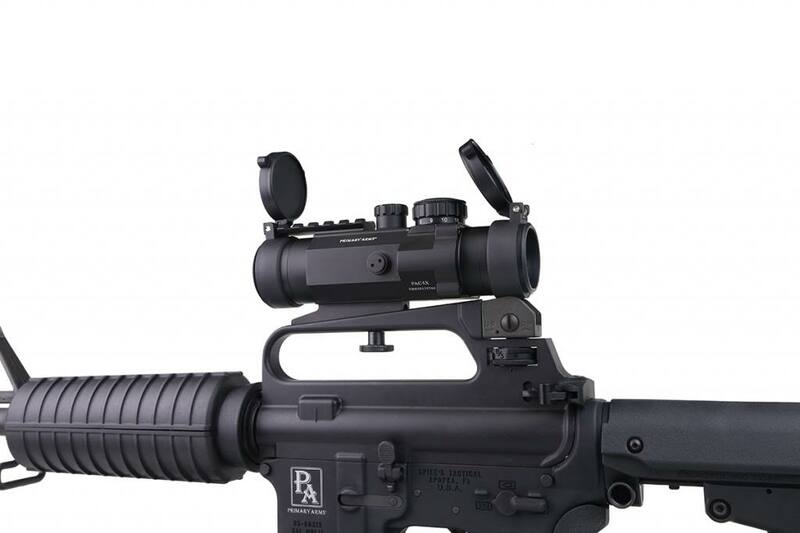 The integrated mount attaches directly to a Picatinny rail, and with an optional mounting screw, you can attach the scope directly to a fixed AR15 carrying handle. There is an accessory rail on top to add a red dot or laser. The optics are very clear multi-coated lenses, and it’s waterproof. It comes with a CR2032 battery and flip-up lens caps. The sight adjustments are in o-ring sealed target towers. The writing with the direction of the adjustments is microscopic, so I wrote them in silver sharpie on the scope body. The .5 MOA adjustments have a positive click and can be turned with the rim of a cartridge or a coin. 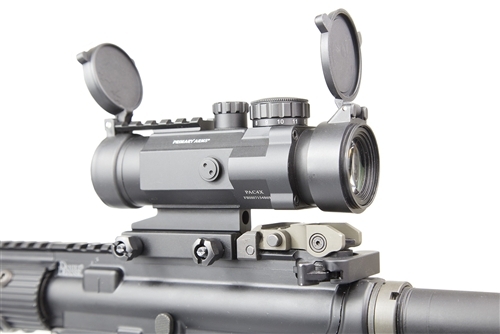 Primary Arms’ own Dimitri Mikroulis has developed a very intuitive and sophisticated self-ranging reticle. 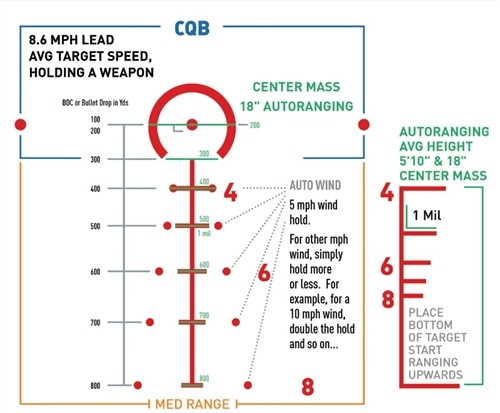 Not only can you range common targets out to 800 yards, but there are moving target leads and wind hold-overs. It is easy to understand and surprisingly uncluttered for all the information provided. The handy pocket-sized two-page manual gives you the adjustments to use the reticle with .223/5.56, 5.45×39, and .308 in different bullet weights. I took my favorite prone gun, a 18″ White Oak Barrel with a Vultor upper and a VTAC float tube and mounted the PA 4X Compact Prism Scope. It uses hexhead bolts, so you need a tool to mount it. PA recommends using thread-lock. The first thing I like about this scope is a diopter adjustment to focus the reticle. Other, more expensive scopes lack this basic feature. Without focus, you may never see a perfectaly clear reticle. The only thing left was shooting. I had 300 rounds of Black Hills 77gr match ammo and an open range. Zero was easy with three groups of five rounds at 100 yards. The .5 MOA adjustments are exact and consistent. It made zeroing a simple matter of measuring the group and dialing in the adjustments. Shooting 77gr, the manual recommended a zero 1″ high at 100 yards. I confirmed zero and then went back to 200, 300, 400, and 500. I got first-round hits on half silhouettes all the way out to 500 yards doing nothing more than using their reticle and system. It is simple and it really works. Over a couple of range sessions, I had consistant 1 MOA accuracy and a great experience working with the Primary Arms 4X Compact Prism Scope. It performed as promised. Through twilight into darkness I got an extra 30 minutes of shooting in because I could light the reticle. I hit everything I could see all day long. 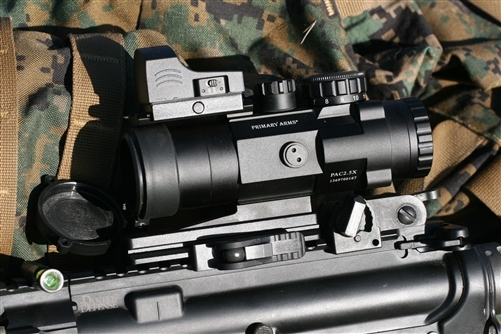 This scope performs right along with Elcan and the ACOG. It is not as overbuilt as the MILSPEC models, but it is sturdy and well made. The adjustments all have solid clicks. The reticle illumination is clear and bright, and it goes to eleven. The reticle design is superior. This scope has a lot of nice features and is perfect for training and contingencies. It is not a precision rifle scope, but it does a great job out to 500 yards.